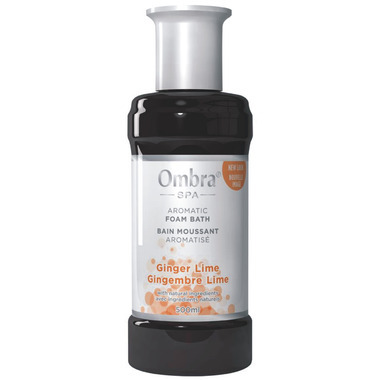 Escape into genuine relaxation with Ombra Ginger Lime foam bath. With its exciting blend of natural ginger, lime, lemon and mandarin orange extracts, this bath is uplifting and soothing and provides a sense of well-being. Favourite scent of Ombra products! Loved this product. Amazing smell. I left the bottle open in the bathroom for a night and the whole room smelled good for hours! Give good amount of bubble in the bath. Very relaxing, natural smell. Love all of the Ombra bath products. Beautiful aromatics, long lasting bubbles, non-irritating and good for sensitive skin. Great all around. A longtime favorite in our household, very spa-like. Gentle on sensitive skin. Fragrance does not bother our allergies. Kiela, what's your *first* favourite Ombra bath foam? This is my second favourite Ombra bath foam. The smell is heavenly!! It says that it "provides a sense of well-being" and it's true. I really feel happier getting out of the tub after I use this, except for the raison toes!! !